Reuters poll: Terrorism most important issue facing country. 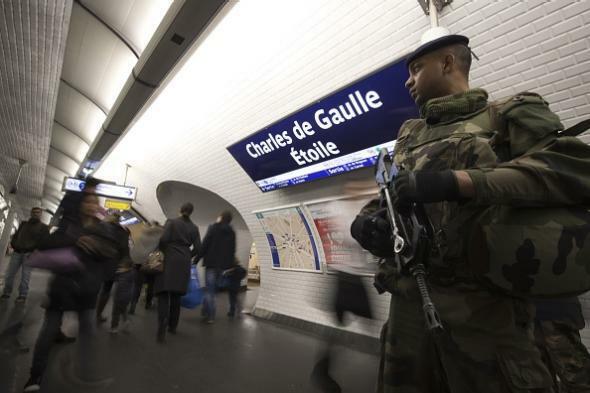 A French soldier in a Paris subway station on Nov. 17, 2015. 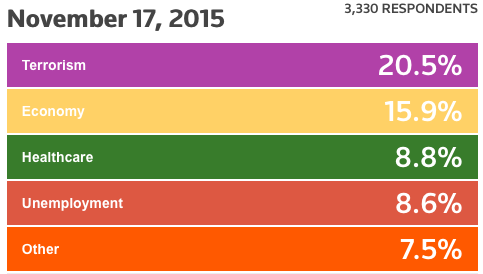 As you can see, terrorism has doubled in popularity as a response and is now the leading concern in the poll. (“Economy” and “unemployment” responses combined, though, still outpoll “terrorism.”) The mass of Republican governors who are making noise about not letting Syrian refugees into their states, it seems, is on to something politically (if not logically, given that most of the individuals identified as having carried out the Paris attacks were French, not Syrian). A different Reuters poll, meanwhile, found that the presidential candidates who voters most trust to address terrorism are Hillary Clinton, who famously voted to support the disastrous Iraq war, and Donald Trump, who is Donald Trump. We live in unnerving times.